Crust: Sift flour and salt together. Cut shortening into flour. Add liquid; roll out to fit pie plate. 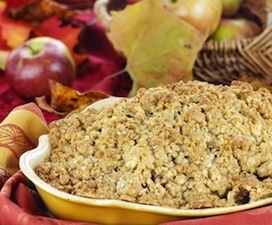 Filling: Place sliced apples in crust; cover with cinnamon-sugar mixture to desired sweetness. Sprinkle flour over top. Cut butter into small pieces; dot over filling. Topping: Cream butter and brown sugar with electric mixer; cut in flour with pastry cutter. Sprinkle pie with topping. Bake at 425 for 15 minutes. Reduce heat to 350; bake another 30-45 minutes, until golden brown.